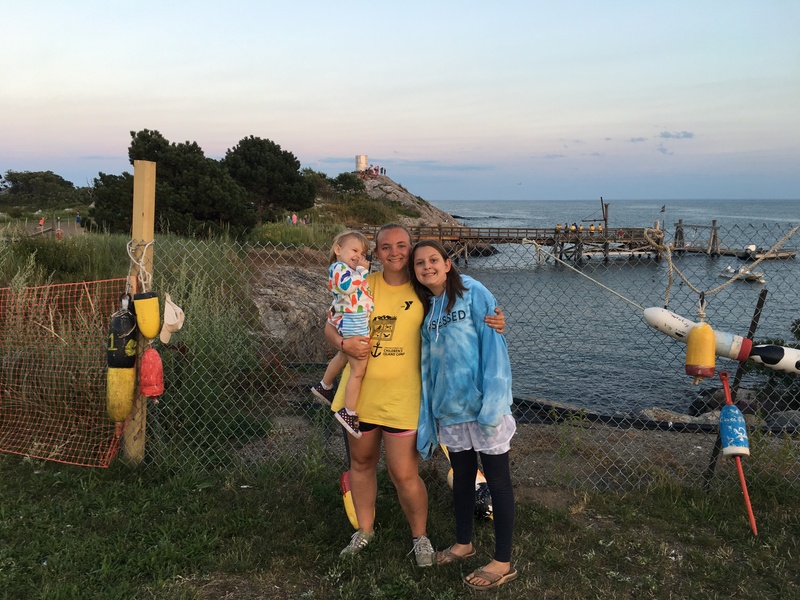 I have referred to my children and stepchildren in the past but I want to first clarify they are all my children both unofficially since the day I met them but I also adopted my two older daughters in April making us one wonderful big funky family of five. The good thing about this is that I can be way more involved in supporting their dreams and goals now. The middle daughter is a huge animal lover. She wants to save every animal and do everything she can. She also is 12 and slips up. She will do a vegan challenge and then eat a burger. It happens. I give the kids two guaranteed vegan meals a day. Breakfast and Dinner. Their lunch is up to them. I think they need to make their choices at school since I know they are healthy at home. They are both very aware and compassionate and want to do what is kind and right. One thing I haven’t gotten into much is that Emma wants to own an Animal Sanctuary one day and she has dedicated nearly every conversation toward this goal for quite some time. We ask her what she wants for Christmas, Birthday, etc. it is money for her Sanctuary or to go to a sanctuary or to do something with animals. She is only 12 and that dedicated. She is learning how to take care of horses now as well and it is very therapeutic for her (I know many vegans are against horseback riding but I encourage her compassionate side. 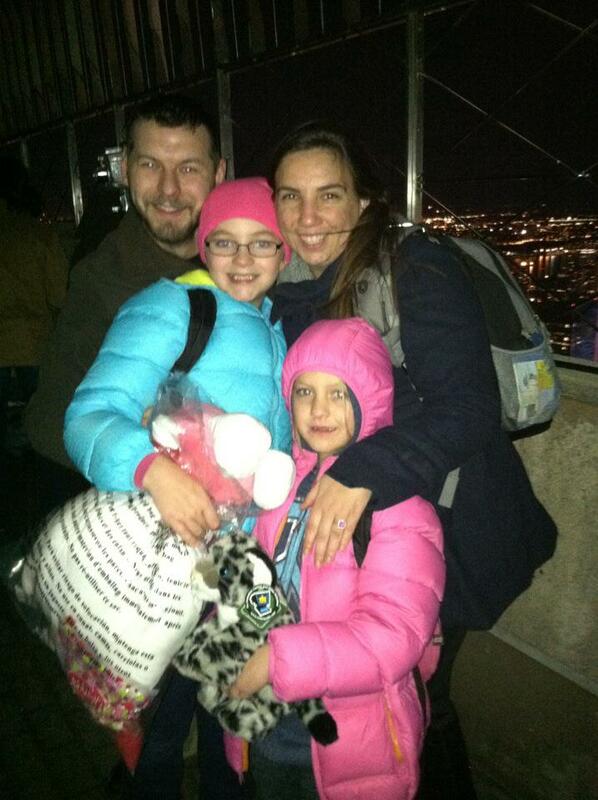 She wants to take care of them, not use them to pull people around Central Park.) If she has them at the Sanctuary she dreams of, then she will be that much more aware of their needs and things that should be avoided because they hurt the animal. I am so proud of the girl she is growing into. In a few weeks she turns 13. So I started a page for her secretly to jumpstart her entrepreneurship of this future sanctuary. I will unveil it to her on her birthday. Emma’s Animal Sanctuary will need many steps and I promised I would help her from the day she asked me very seriously about it. I told her she needed to study in college and make sure she could do everything that encompasses owning such a venture. Since then she has made design plans, business plans, ideas for raising money. I said she’s incredible right? Well anyway I want to share her page with everyone so you can donate, help out, volunteer expertise, or anything. She will be grateful that you are supporting her in any way. For a girl that came into my life as a toddler to now be so strong is a dream. She has conquered some serious things in her little life and she pushes through PTSD and Anxiety by therapeutic animals and people. She wants to give back to other girls like her while saving all the animals she can. Compassion is her medicine and she wants to share it. So help me help her. This is a big goal and I will need the whole community to make this happen. Happy Thanksgiving. This is the time of year for fuzzy warm socks and hoodies and boots. I love Fall more than any other time of year. I am lucky enough to have just celebrated my daughters first birthday and made her a wonderful Almond Cherry Cake that I will absolutely post soon. However, it was a soup I made last night that I just HAD to post. 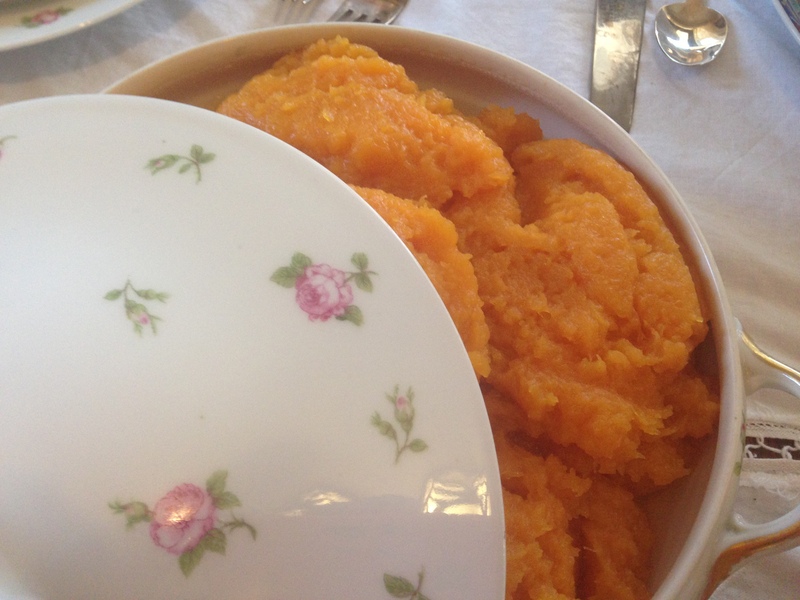 I had 4 small sweet potatoes sitting on my counter begging me to cook them but nothing I thought they would pair with. I wanted to have soup for dinner but I was out of my signature squash cashew and I had no cashews to cream up any veggies I had. That’s when I thought that maybe I could make a roasted sweet potato soup with coconut milk and it would be so warm and delicious on this really cool fall day. It was about 54 degrees outside and I could feel the first chill seeping through the windows. I warmed up the oven to 400 degrees took out my baking stone and roasted the four sweet potatoes for an hour. No oil, no salt. 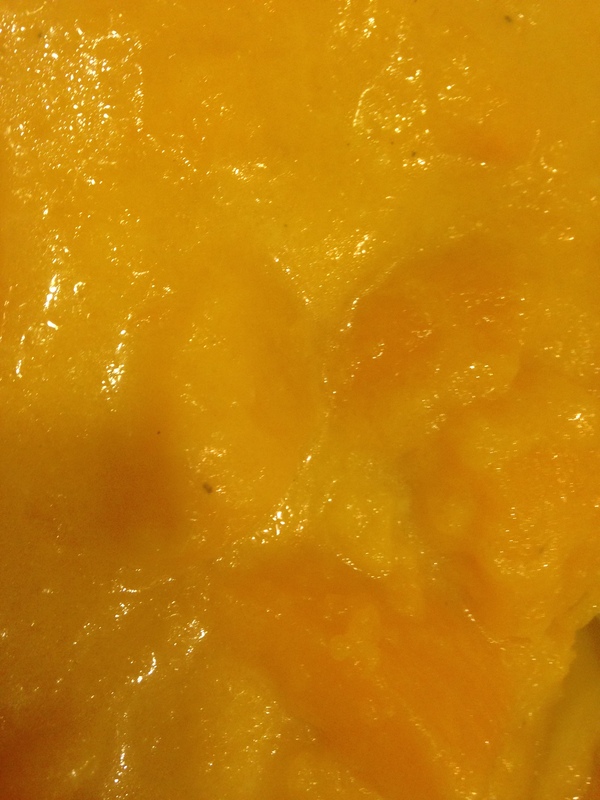 When the sweet potatoes were roasted, I peeled them and tossed them in the Vitamix with 2 tablespoons maple syrup, 2 tablespoons curry spice (yellow), 1 tablespoon coconut oil, and 1 cup apple cider and pureed the mixture. It was very thick. 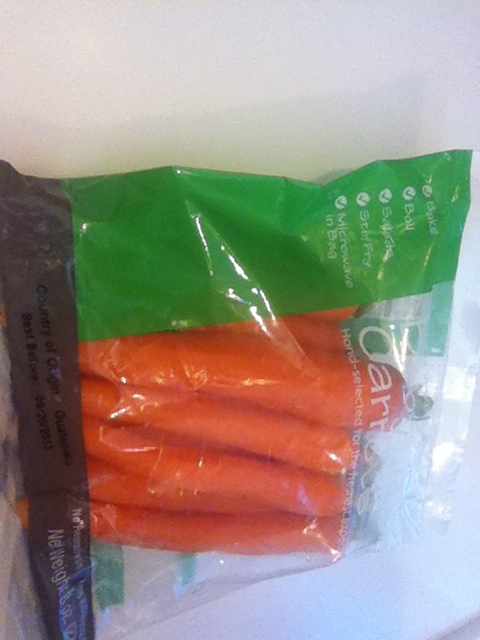 I then boiled a broth of onion soup mix and 4 carrots for about 20 minutes and then poured it into my vitamix. Blend until smooth and transfer back to the broth saucepan to warm through. This was the most amazing soup. I poured it into a soup bowl that had a scoop of mixed steamed grains in the center. 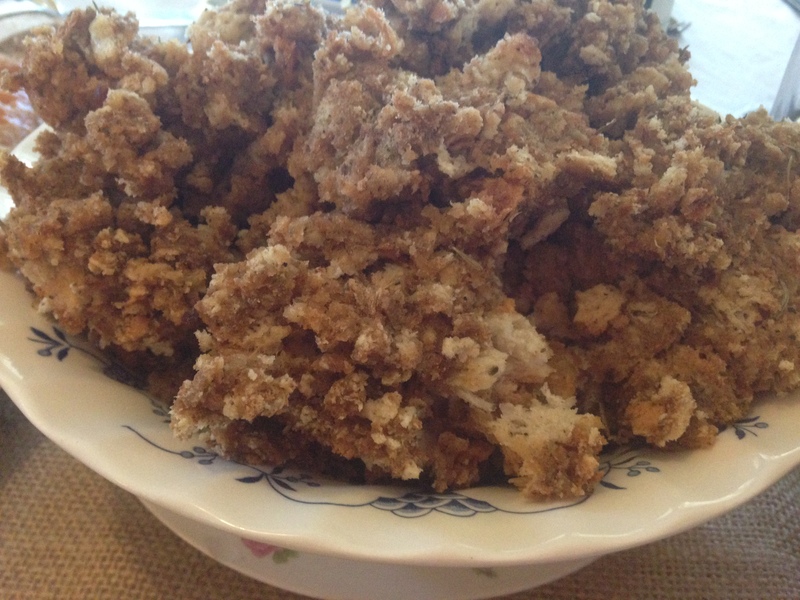 THe grains I made in my rice cooker. It was equal parts 1 cup of: Amaranth, Brown Basmati Rice, and Red Quinoa. 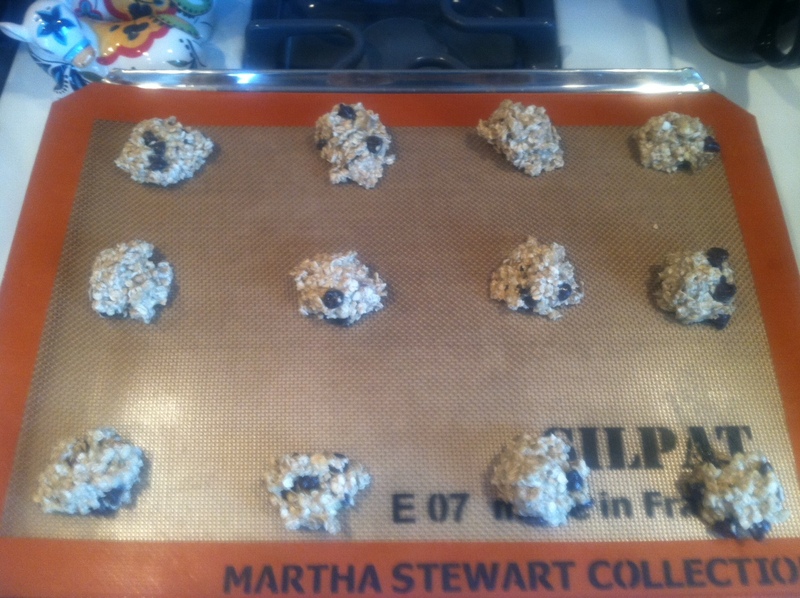 I then added 1/4 cup of black chia seeds and 1/4 cup of split peas for extra protein. The meal was hearty and warm and everything a fall or autumn meal should be. Everyone loved it. 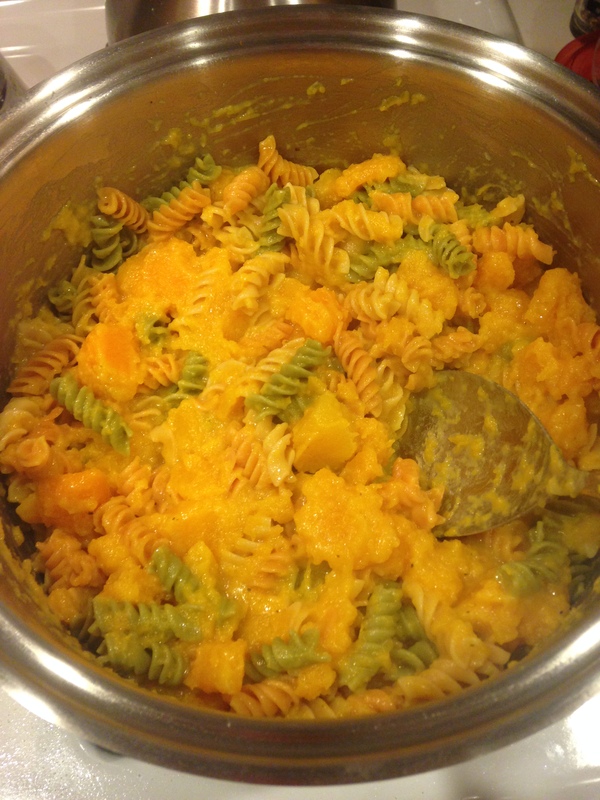 My stepkids loved the smell so much they ate a second dinner after having gone out to dinner with my parents already! So I know we are far far from Thanksgiving. But that is when my baby is due and that was on my mind when I was cleaning out my freezer and saw a huge bag of cranberries. In Massachusetts we are known for our cranberries and can pretty much acquire them year round. So I decided to make some cranberry sauce and that way I could cook down the cranberries and get them out of the freezer. I added 1 cup of sugar for every 12 ounces and then a splash of water. Nothing fancy. 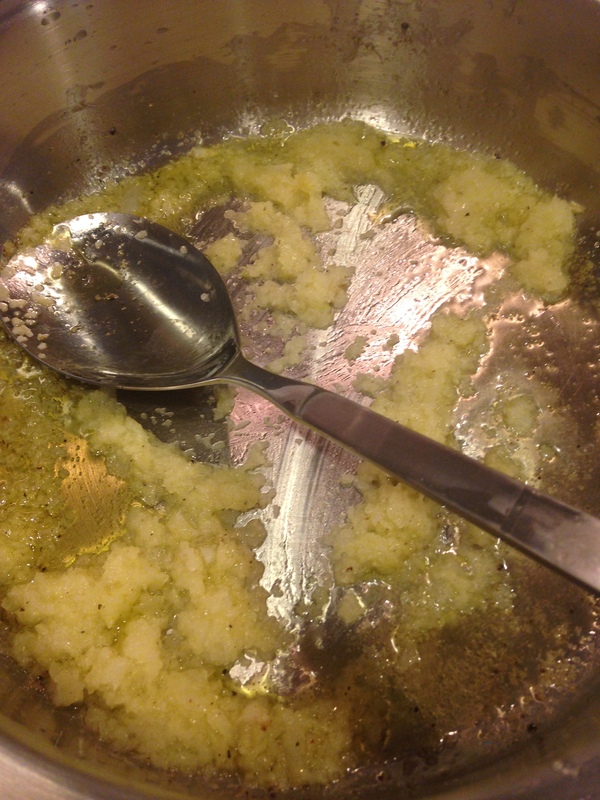 As I was cooking them I realized I also had stuffing leftover and thought…. THANKSGIVING SANDWICH! When I was a kid, my father never ever ate leftovers. He hated leftovers. I did not, I figured free food and dragged them back to college as I got older. However, my Dad was always okay with Thanksgiving dinner leftovers in which we made leftover thanksgiving food sandwiches. 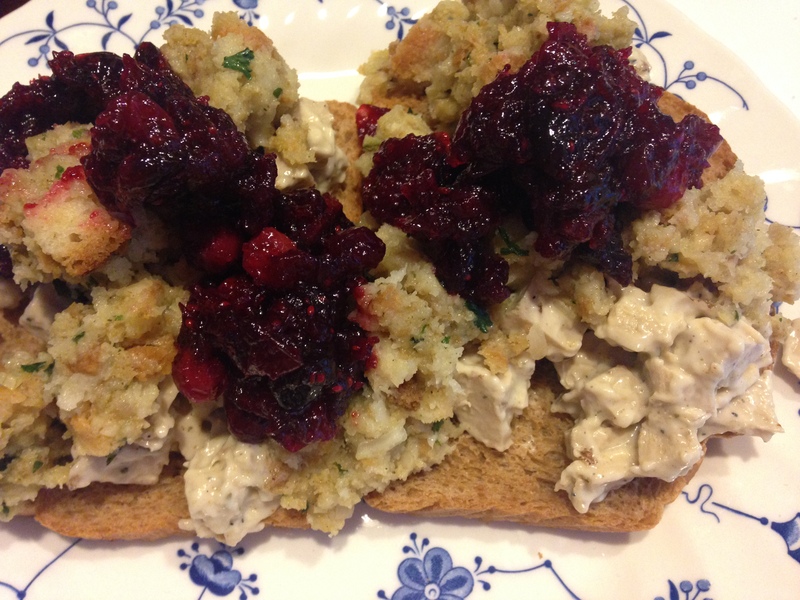 Turkey, gravy, cranberry sauce, stuffing, potatoes, whatever you had and boom it went into a big open sandwich. 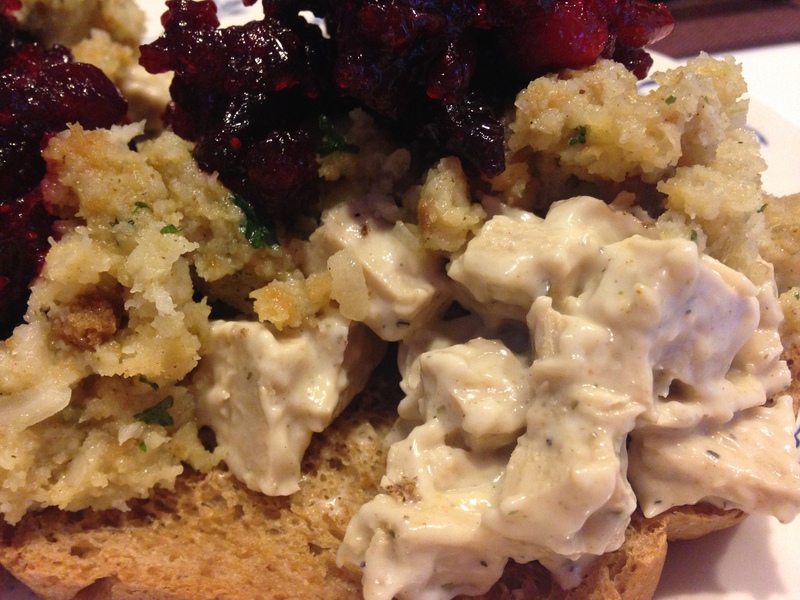 So when I realized I had ingredients I thought if I make a chicken salad with Beyond Meat I will have one heck of a Thanksgiving Sandwich! So I did and my husband ate two of these sandwiches so you know they are good! Enjoy! Cranberry sauce: Combine all ingredients in a pot over medium heat until well combined and the cranberries pop and sugar dissolves. Continue mixing until sauce becomes less whole cranberry and more jellied. Take off heat and cool. Chickenless Salad: Dice Beyond Meat strips and then toss with mayo and seasoned salt. 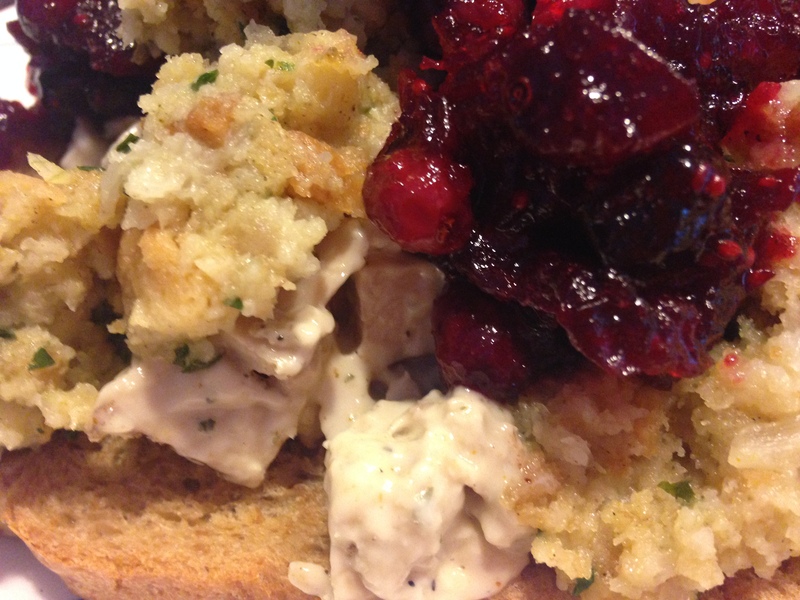 Top bread with cranberry sauce, chicken salad, and stuffing. Enjoy! Food is Love. The Hippie Gypsy. I want to start this with a shout out to the staff at the Bedford MA Whole Foods. You guys saved the day on Thanksgiving. I had ordered a holiday vegan “turkey” en croute from Whole Foods at another location for my Thanksgiving. My mother was kind enough to pick it up while I was working only to find a goat cheese log in the bag as a substitute. First off anonymous grocery staff that so lovingly tried to put a sub in for the missing vegan meat, goat cheese is not vegan. Second, why didn’t you call? I know that sounds like a wounded ex-girlfriend but honestly this is a major holiday and I am always plugging Whole Foods since you are the vegan guru’s of the Northeast as well as I help out writing recipes locally. If you don’t have a product tell the person who ordered it. Don’t just toss in a cheese log and hope for the best. The Bedford Whole Foods got a call from me in a panic and not only gave me many options, they gave it to me for free because they felt bad about what had happened. All I can say is you are amazing. I tweeted how amazing you were that day but I wanted to write about it formally. It made my day and the next day it made my dinner. The Field Roast en Croute was delicious. The instructions were easy to follow. I was in heaven and leftovers were easy to reheat with a little water added to the bottom of the bowl. 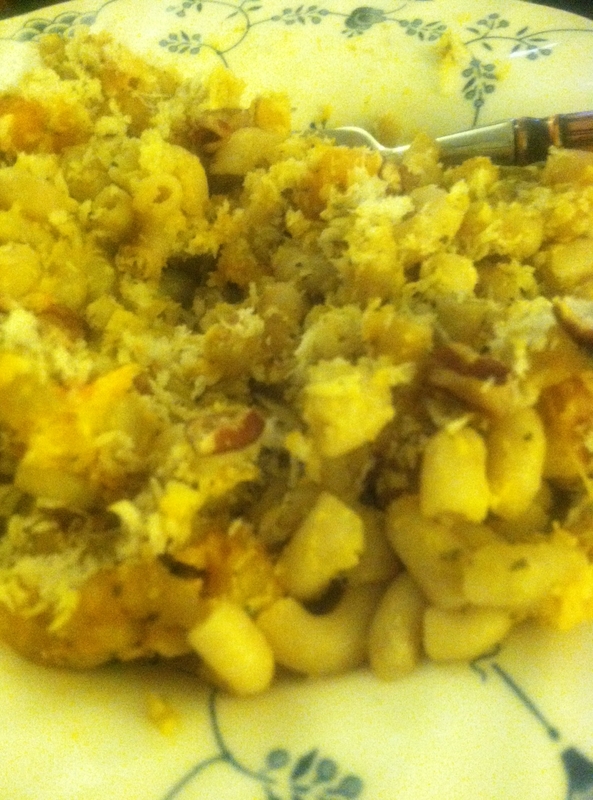 I topped leftovers with a little Daiya Havarti and was in heaven! 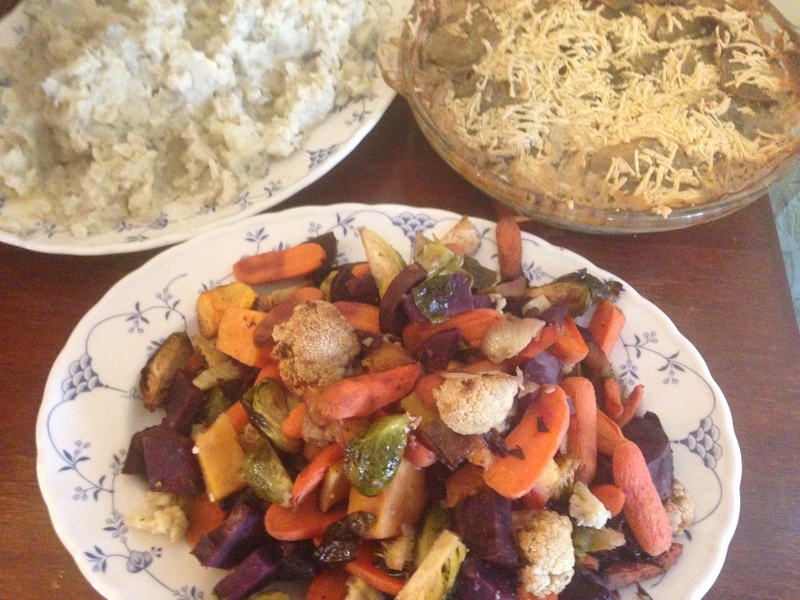 I made the rest of the holiday meal vegan except the Turkey. Yes, I cooked a turkey. It was from Whole Foods and organic and local and all that jazz. I did feel bad but I am the only vegan and I try not to take things too far. My husband eats mostly vegan these days and my mother is vegan or at least vegetarian until dinner time so I feel like I have made such a huge impact that one day a year I will make them something non-vegan on a table that is completely vegan otherwise. They appreciate the effort and I appreciate their effort all year long. All I can say is that the vegetables with olive oil, salt, pepper, and drizzled with maple syrup were my favorite but the potatoes au gratin were the show stopper for the rest of the group. They loved them and I mean LOVED them. I got more compliments than I could’ve imagined. Especially seeing as only my dad and I ate them last year. I kinda regretted it because I love them and had only a tiny portion left over. Dessert was also an amazing success with vegan chocolate chip cookies, cranberry upside down cake, apple caramel pie, and a vegan pumpkin pie my mother bought at Whole Foods in Boston. All in all it was a great success and I cannot thank my friends in Bedford enough. So from my Family to yours. Thank you and Happy Holidays! 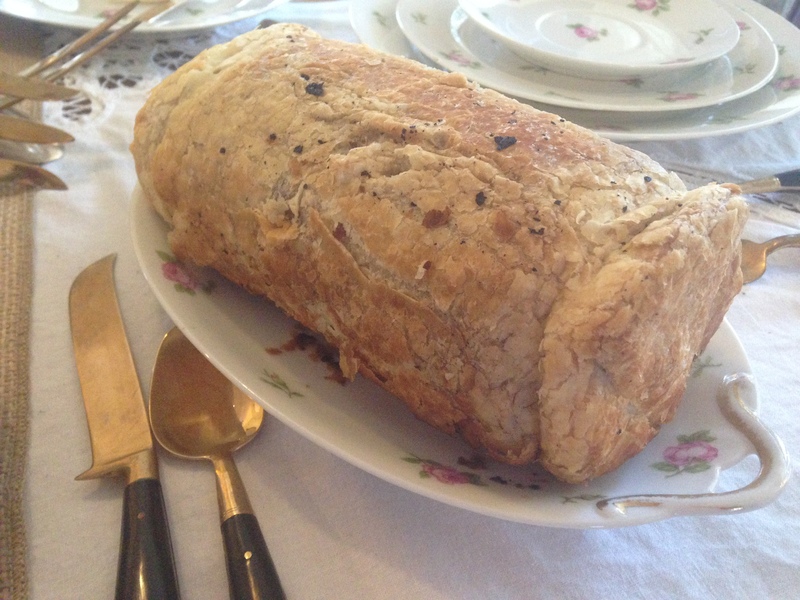 One month before, order your roast or turkey or tofurkey or field roast en croute. 2-4 weeks before, hire someone to clean your house the day before the holiday (It is about $150 for a whole house but you can prob get a good deal for just the downstairs). That way they can clean up whatever leftovers are on the floor from your chopping that the dog didn’t want. One week before get all linens, dishes, china, etc. cleaned. Get your hair done. Get your nails done (shellac or gel is smart in this case). Buy any theme holiday items that you need. Set your table aesthetics but not plates. Buy all your veggies the weekend before or a few days ahead. Wash, Chop, and Bag all veggies as you get them. This will make mashed potatoes and roasted veggies go fast the night before. It sounds crazy but peeling one large potato takes about 30 seconds. It will be worth it to do it as you get them when you have 10 lbs to peel and chop. Buy yourself something easy for breakfast so that you don’t need to cook. Donuts, danishes, or just plain old cereal and fruit. You WILL need energy the day of. Two nights before, pre-bake crust or buy them already done. Pre-chop all fruit and make any rice or pasta and bag it. 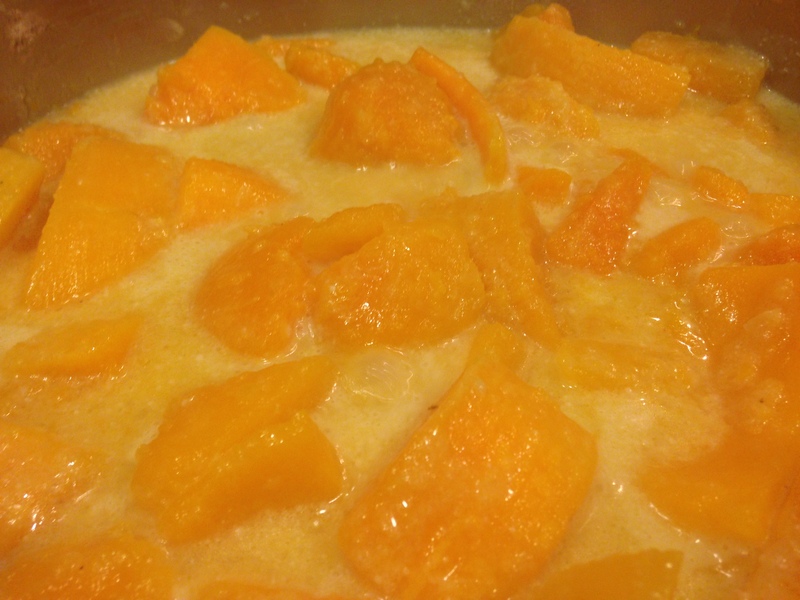 Fruit can be tossed with a little water and lemon juice if you are afraid of browning. The day before Thanksgiving make any sauces and dips. They always taste better if they infuse overnight. Slice any cheeses and prepare any doughs (cookie dough or bread dough). 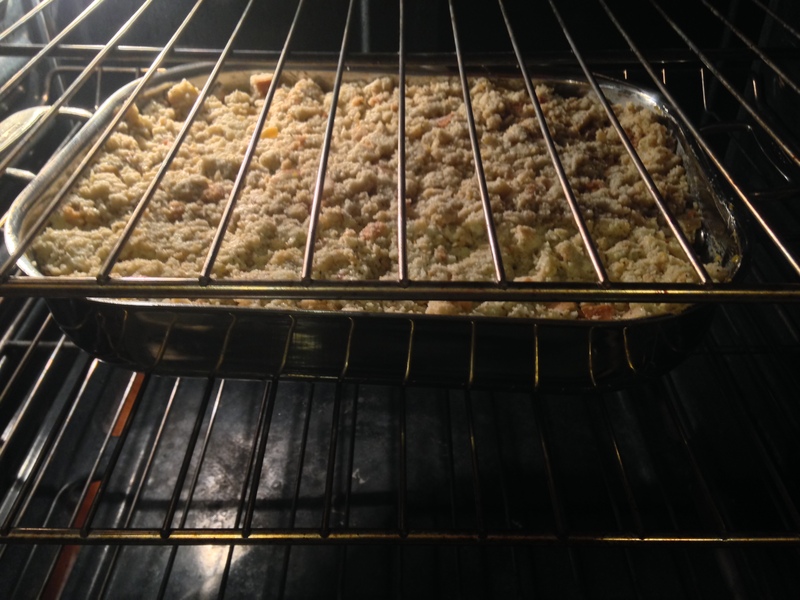 The night before make any roasted veggies, casseroles, and prep desserts. You can bake desserts fresh since they come after dinner and all your casseroles and veggies can be warmed up while the turkey sits and cools a bit. Also brine your turkey if you get one and place in the fridge. Sit down have some tea and a danish and baste that turkey or tofurkey. An hour before arrival bring out ice, glasses, drinks, and appetizers and plate them. By the time you are done others will be arriving. You will look like you have it all together! When the turkey comes out place all precooked dinner entrees in the oven to warm back up. When it is time to eat place the desserts in and remove all appetizers and place in covered containers. After dinner place leftovers in large bowls and containers. At the end of the night you will have a buffet for people to make take home bags! Place out desserts and coffee and tea after dinner has been over roughly an hour to two hours. People need time to settle. Take a walk during this time or have an impromptu flag football game for the guys and kids! Or do the dishes if its too cold! Last, enjoy dessert. Set up the to go containers (I ask all my guests to bring some with) and set up the buffet for people to take home whats left. FOOD IS LOVE. 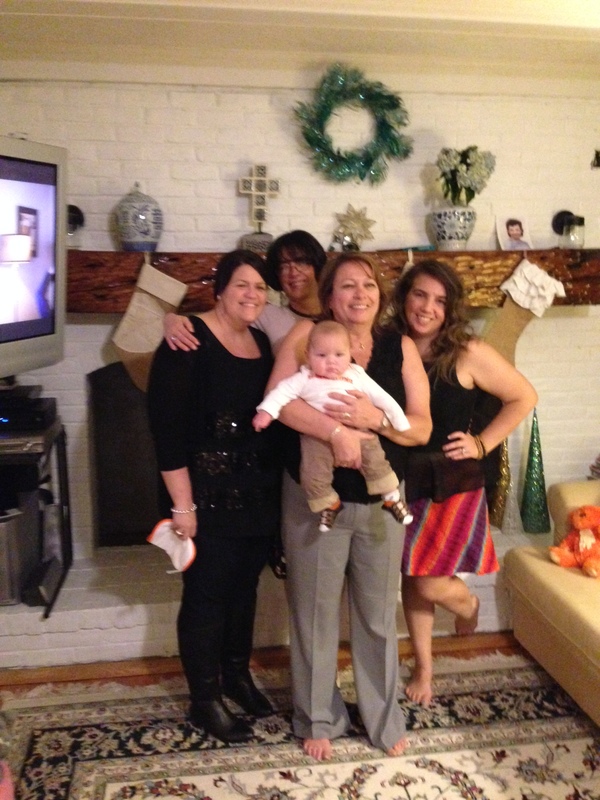 Happy Holidays from My family to yours. I am going to officially post my Thanksgiving Day menu here for all to see. I know there will be questions and recipes wanted and over the next week I will try to post those too. I truly delight in the Holiday cooking I get to do. Making food for my family and friends is fun because not only do you get the joy of the cooking process but you get the joy of watching others feel happy and healthy and nourished and maybe a little stuffed on something you created. I also find it amazing how we extract things from the earth to make our bodies fuel. 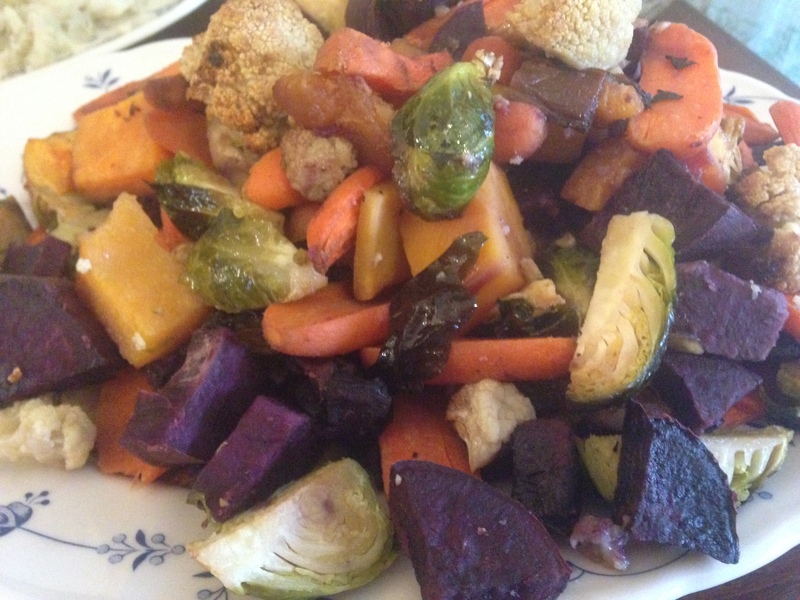 One would say if something is on the ground not to eat it but Thanksgiving is the holiday of root vegetables. Of course they get a heavy rinsing but its kind of a strange concept how we shun some things afoot but not others if prepared properly. I know there will be confusion as some of these items are not vegan but I do have an all omnivore family so I pepper in a few items that are not vegan (*denoted with an asterisk* ). Prosciutto Pear Cups are not vegan. They are a Martha Stewart recipe that I used to make pre-vegan and my family still asks for and I make in mini muffin pans chopping the pears into tiny pieces and tossing with shreds of fresh Parmesan. The cheese will be a mix of vegan and vegetarian. I eat honey but I know many vegans do not so I denoted it with an asterisk (and you can always use agave!). The turkey and gravy is not vegan (obviously) but there is a mushroom alternative and my own vegan Field Roast Turkey. Everything else is vegan. The potato au gratin is one of my favorite things to make and the cranberry upside down cake has become a requested staple from my husband and was of my late grandmother. Enjoy! Homemade Cranberry Sauce: Sugar and Cranberries! Tea: Yogi Kava and Yogi Detox are always in my house. The leaves have fallen here in Boston and Thanksgiving is seemingly right around the corner. In a month or so we vegans will be all gorging ourselves on root veggies and Tofurky. I love Thanksgiving. It is one of those days that you can remember just by smell. It has its own foods and own seasonings. I relate Sage and Thyme to Thanksgiving. As soon as I smell them I am like “mmmmmm”. 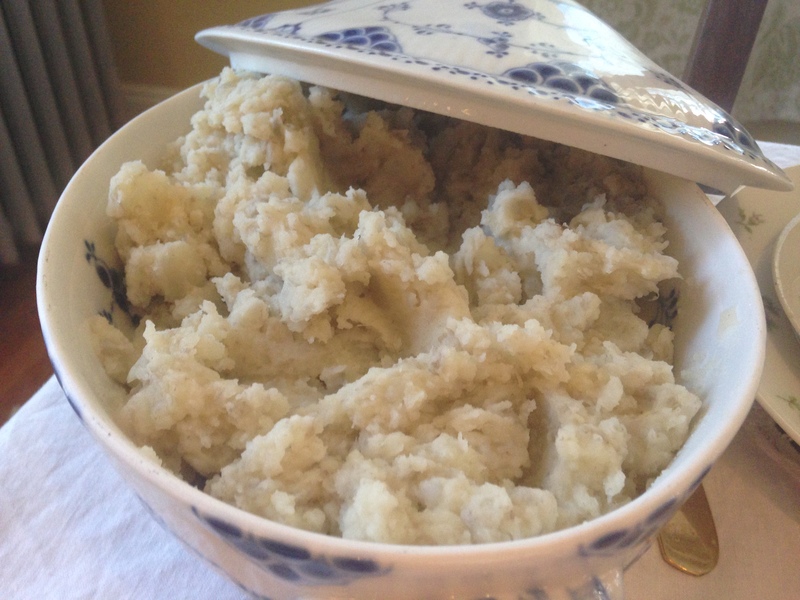 It brings my 10-year-old self back to sneaking stuffing and scoops of mashed potatoes before the Turkey cooled. In my family I am in charge of Thanksgiving. Which I love. I love cooking everything (except the Turkey because the husband does that although I do try to help prep it). 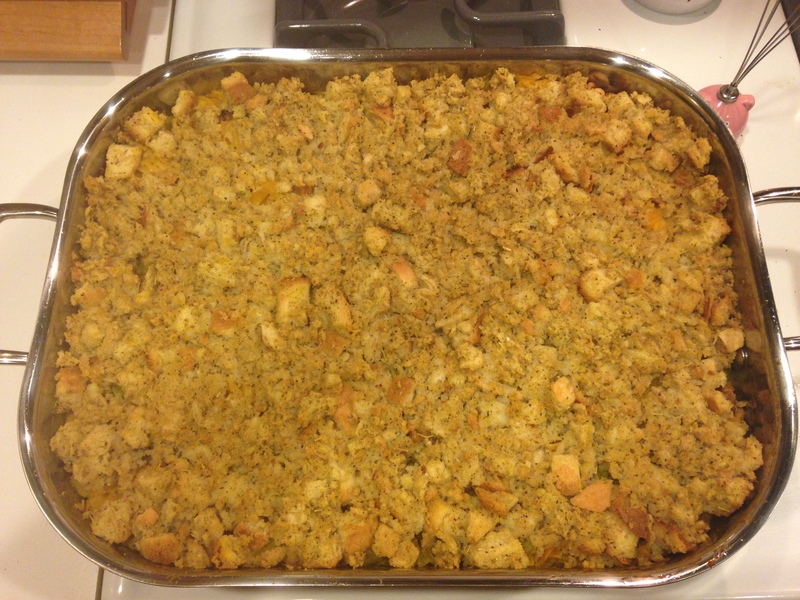 I make my own stuffing from scratch and then some bagged for extra and to stuff the turkey which I don’t eat obviously. However who doesn’t have leftovers? I only know one family. My aunt and uncle because they have 11 kids over the age of 16 and many have their own kids. So I was informed there are no leftovers and 20lbs of potatoes involved. It gave me flashes of a catering company trying to work out of my own kitchen. Insanity! So back to leftovers. We usually have stuffing, roasted veggies, and potatoes. Why not make these leftovers into something you can eat later in the week. It doesn’t have to be thanksgiving everyday for the next month. You may (or may not) get sick of it but transforming it is something that will make it that much better. 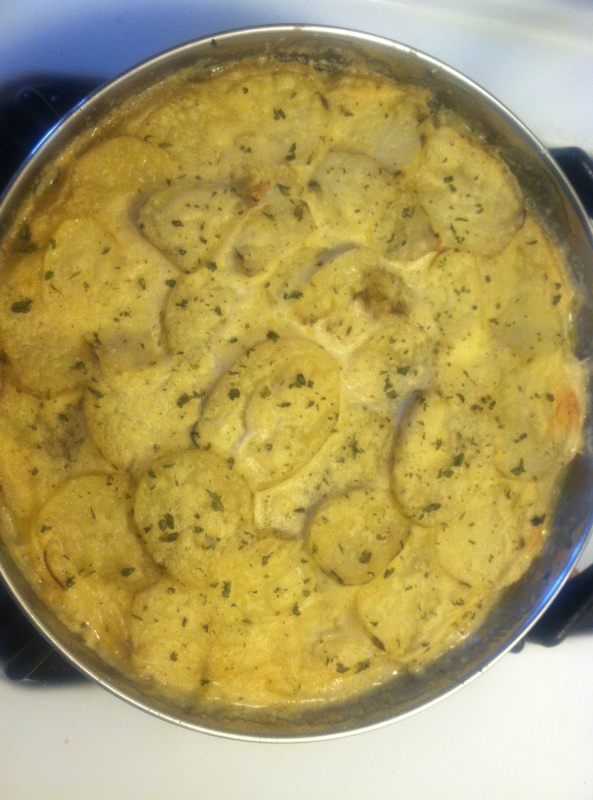 Or heck just make this casserole as a side dish or a meal anytime in teh fall or winter as it is definitely a hearty and yummy one that my husband gladly eats out of a mixing bowl. 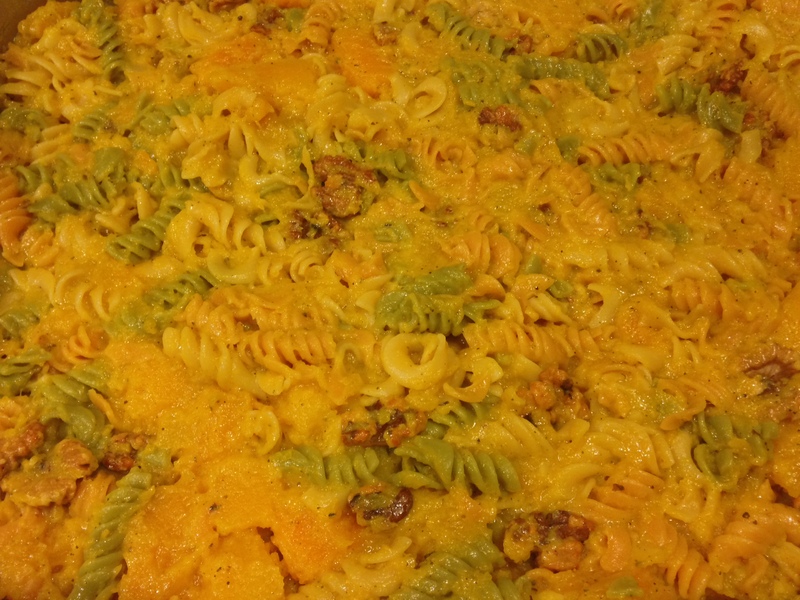 Here is my adaptation to a Whole Foods Recipe I noted last thanksgiving that I love for a Butternut Squash Macaroni Casserole. 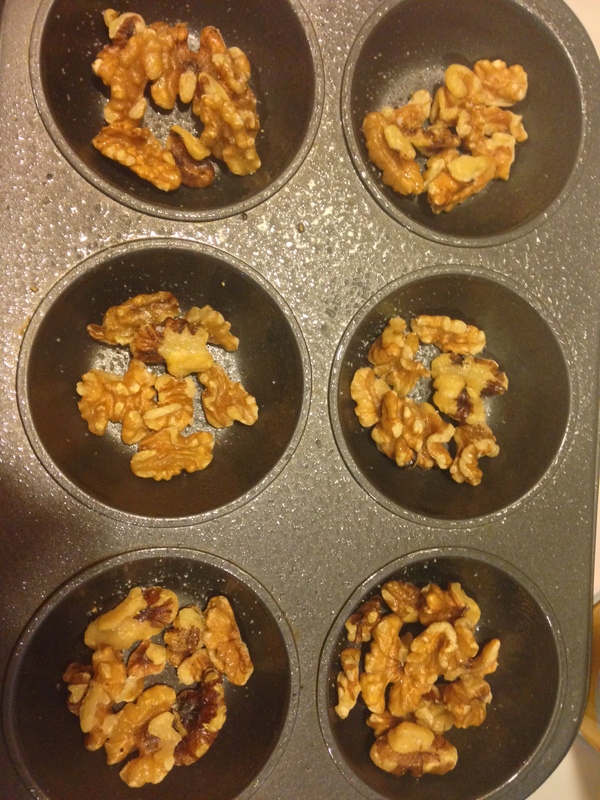 Spray a muffin tin with oil and place nuts in it. Sprinkle them with salt, pepper, sage, and thyme. 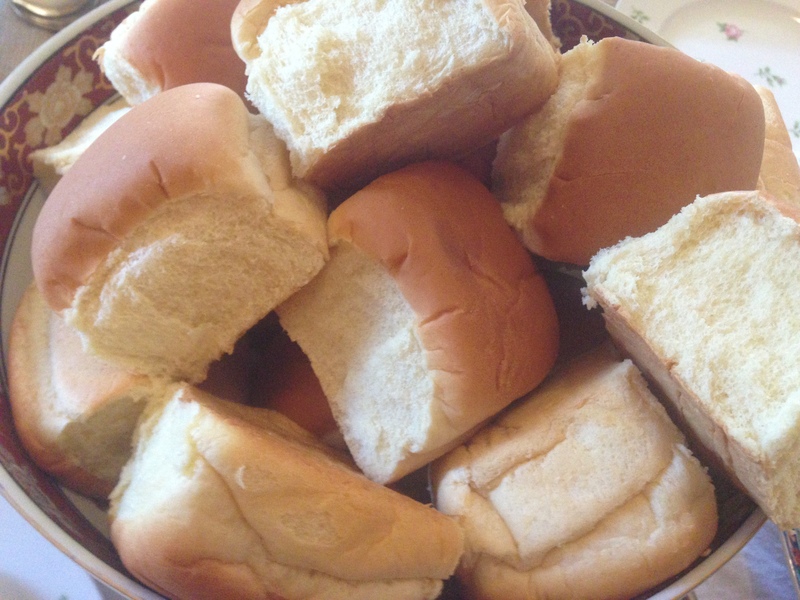 Bake for 10-15minutes to toast them. Spray a large casserole dish and place to the side for the casserole. In a mixing bowl add broth or water to the dry stuffing and salt, pepper, thyme, and sage and a little bit of melted butter or olive oil helps. When welll combined and wet place to the side. This will be your topping. 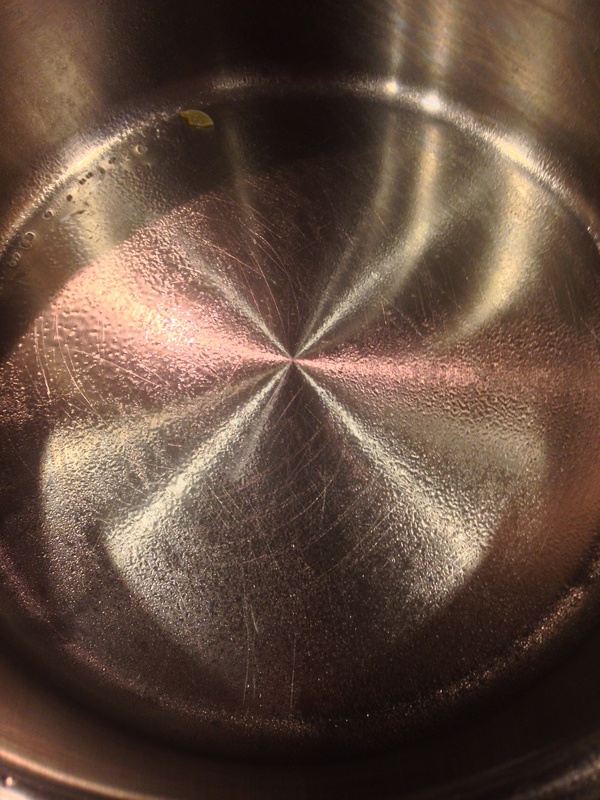 Use a large sauce pan to boil salted water for the pasta. Cover and place on high. In a smaller sauce pan place 2tbsp olive oil, salt, and peper over medium until warm adding diced onion into it until soft and golden. 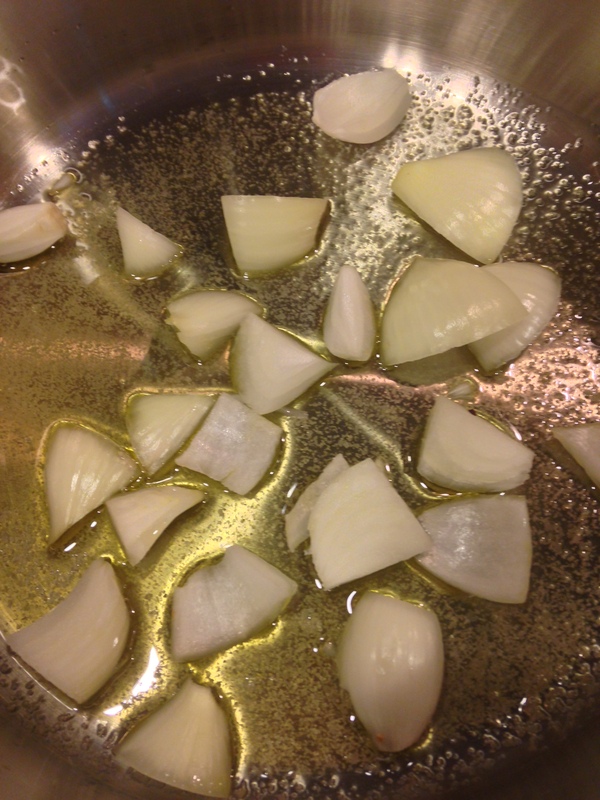 Take onions and puree them with a mixer or blender and dump back in sauce pan. 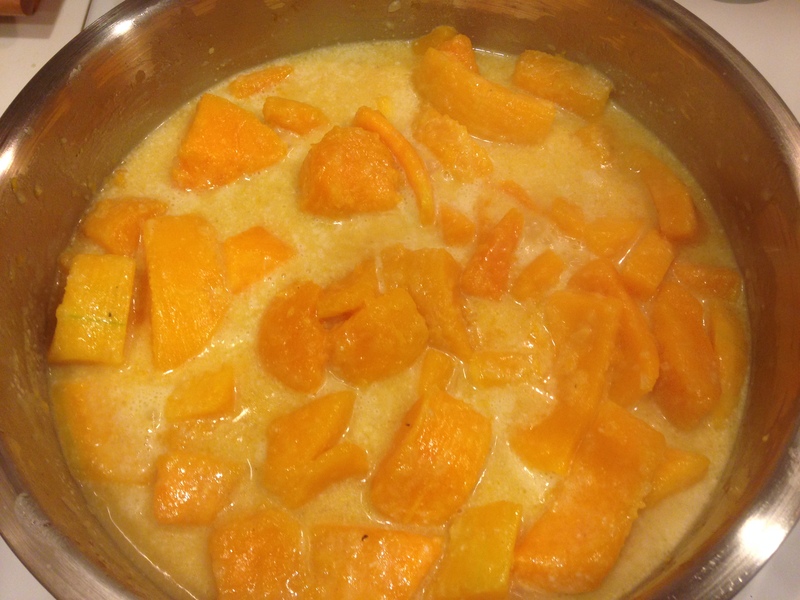 Add coconut milk (I use Goya or 365) and squash to onion pan mixture. Season with salt and pepper. Allow to cook down. When water comes to a boil add pasta and cook until al dente. Drain pasta. Spray bottom of pasta sauce pan with olive oil so the pasta does not stick. 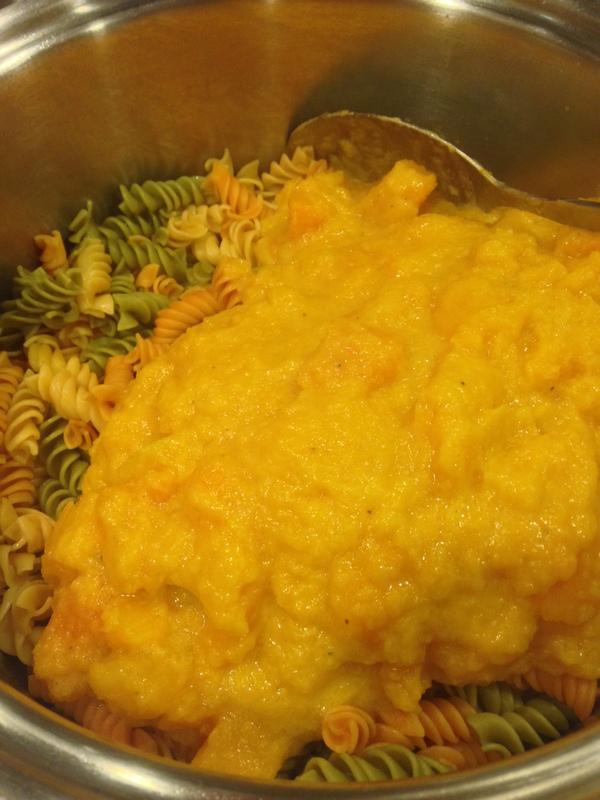 When the squash is soft and the mixture has thickened add to the pasta and stir until well combined. 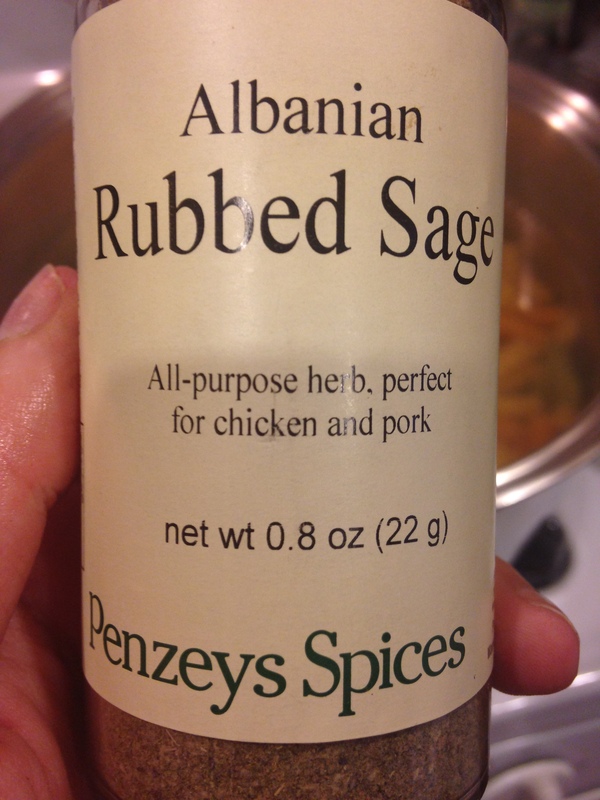 Then add toasted nuts and 1-2 tablespoons of chopped sage. 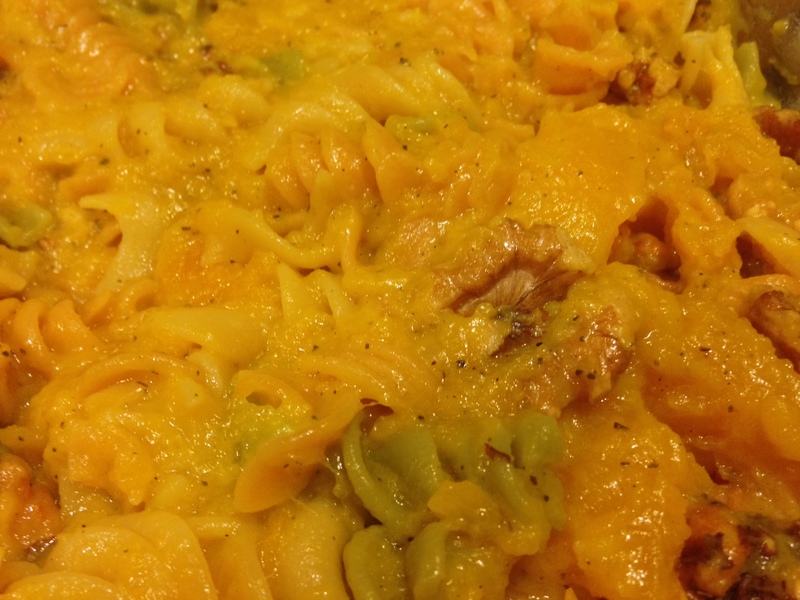 Place mixture in oiled casserole dish and press flat. Sprinkle with salt. 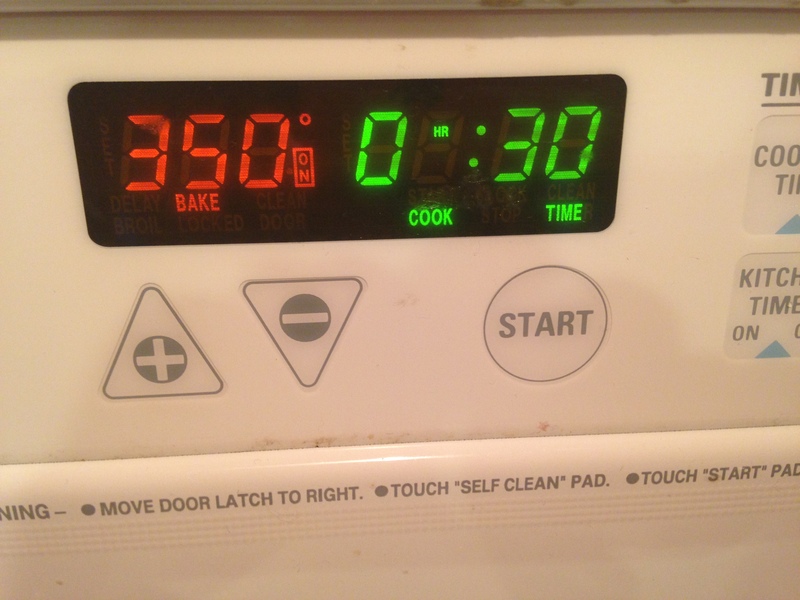 Bake for at least 30 minutes. So with that cool Autumn Air for inspiration and the smell of fried dough I can’t eat in the air (and a line a mile long that made me grateful I couldn’t) I will give you three of my recipe testing reviews. 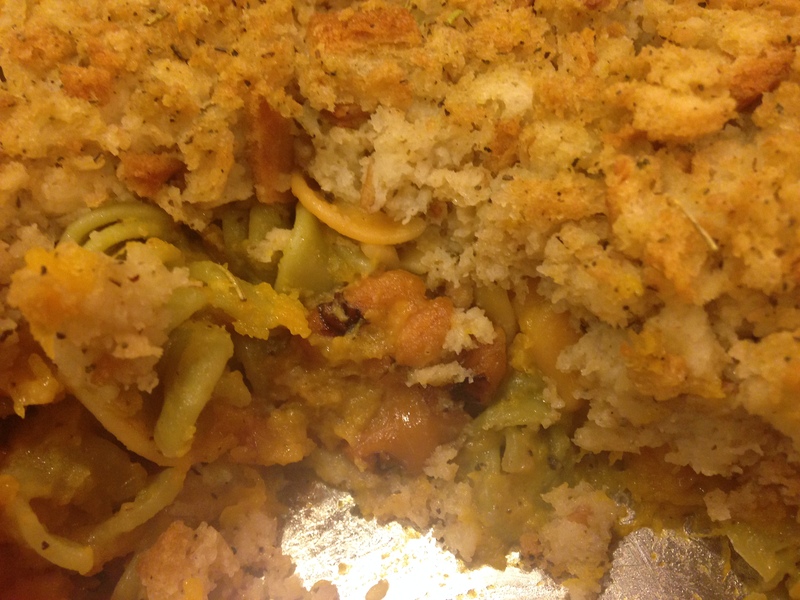 I made biscuits, butternut squash macaroni, and pumpkin chocolate chip bars. I would also like to note that I had to order some of the stuff online that I needed for these masterpieces (and more that I plan on making) from various sources which is partially why I have been offline. RESTOCKING! My favorite is always www.veganessentials.com because they have almost everything. 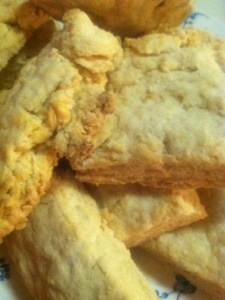 Let’s start with Mom’s Vegan Kitchen All Purpose Bisquits (http://store.veganessentials.com/vegan-all-purpose-biscuit-mix-by-moms-vegan-kitchen-p3330.aspx). This is an investment of time. You will need to roll these out twice folding in between and cut that cold soy butter (earth balance) quickly and into small pieces keeping in mind the whole bag is not the serving size directed on the back of the bag for isntructions. They do it based on 2 cups and there are five in the bag. Next issue, you need to make them as high as possible as they do not rise much. I would also advise adding extra plain soymilk. After they get cool they dry out a little. Last issue, my husband said they were too salty once you add butter and applied marmalade instead to contract with sweetness. They were delcious but had to stay warm or they got dry and a little hard. I added homemade hash browns for him (diced russet potatoes, earth balance, bell peppers, onions, and salt/pepper) and he was happy. What about you folks? Too salty? Better way to make them moist? How about a different brand? Should I try the Joy of Vegan Baking recipe next time? I got this recipe in my inbox and the picture looked amazing so I was in! 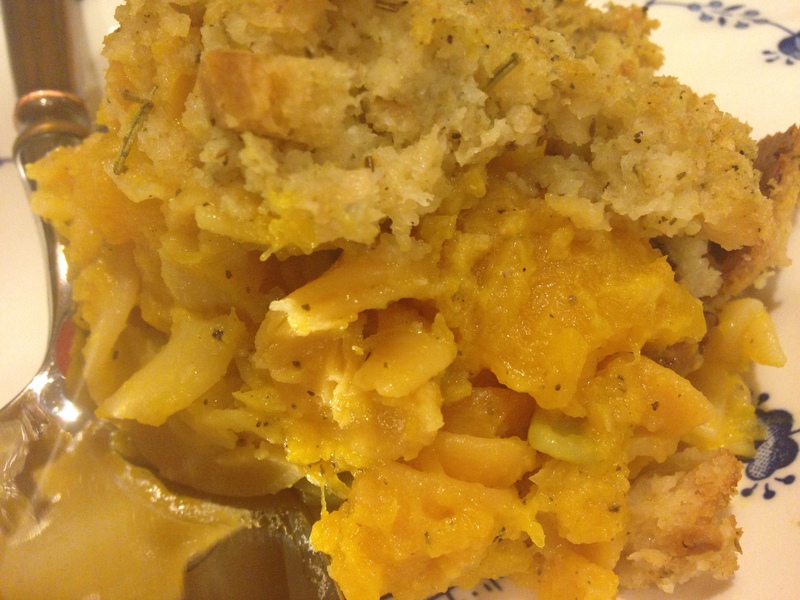 This makes your whole house smell like thanksgiving and is relatively simple to make. I call it a dump and go. You dump most of the ingredients into your cooking pots and pans and heat. 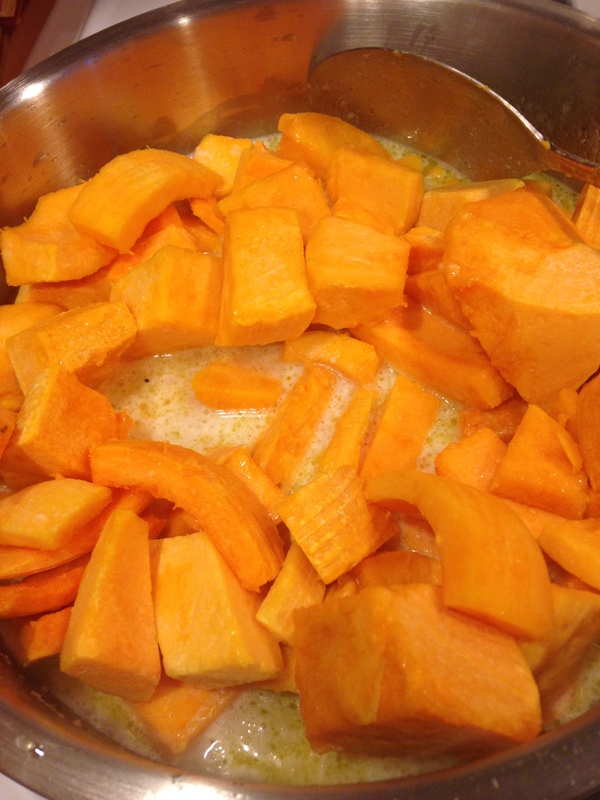 There is chopping of the squash involved but I am sure there is a way to buy it pre-chopped. However, I happened to have a whole squash from a friend’s CSA that she got too many of. Score for me! My suggestions: Use any nut you want. I used pecans because that is what I had in the house. Nest, don’t use panko breadcrumbs. 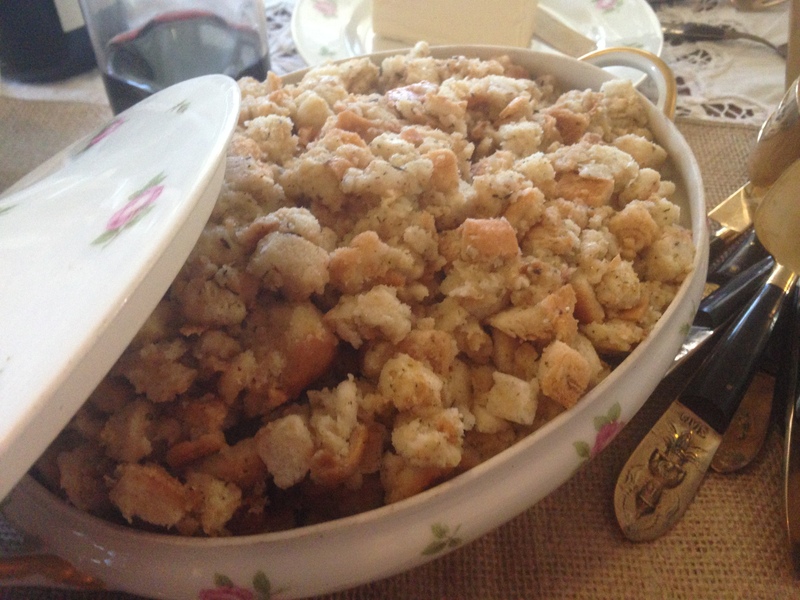 Go for a hearty breadcrumb or even a stuffing on top. It needs the saltyness. Mine was way undersalted despite salting everything individually. 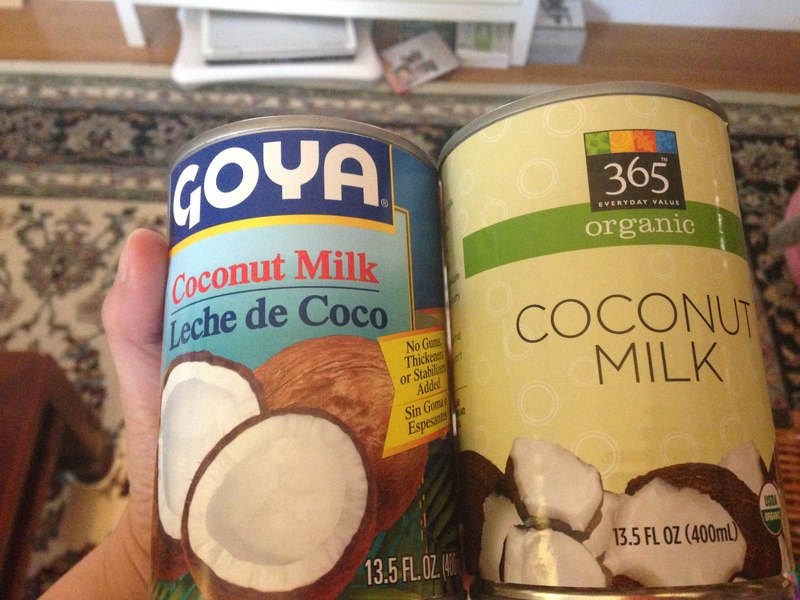 I swear coconut milk eats up salt magically! Overall: This came out delicious. If I weren’t vegan I would still eat it. 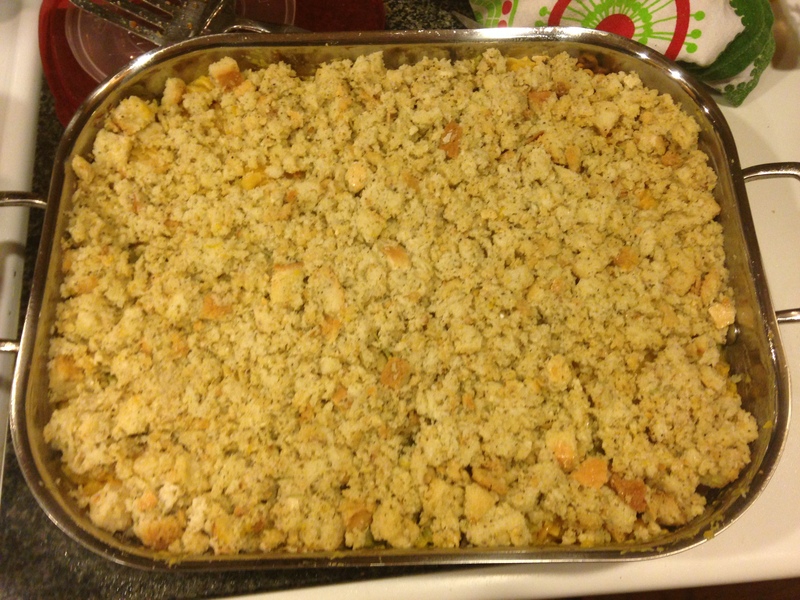 You can make it into a casserole and add faux chicken and other veggies and top it with stuffing and make it the yummiest Thanksgiving side dish ever. I love this recipe with my whole heart! TELL ME HOW YOU MAKE OUT WITH A DIFFERENT BREADCRUMB! First if you haven’t heard of Mavis and her goal to only spend $100 a month on groceries while growing the rest in her 1 acre yard in the great Northwest, well you need to! I look forward to her blog and its insights, hilarity, coupons, and guidance each night. She posts recipes for all types omnis to vegans. She has her own chickens, gardens, bartering neighbors, and nicknames for all. I love to read about how her life is and what it is like to be an urban farmer in essence while being green and thrifty. But I love it most when she shares her vegan recipes from her garden of goodies! 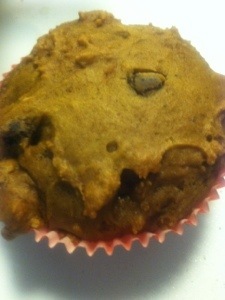 This week was pumpkin chocolate chip bars. The good: They are sweet and yummy and you can portion them out in muffin tins. The bad: My husband ate almost all the chocolate chips (365 vegan semi-sweet) so I had to sub 2/3 of them for pecans. The ugly: I am on Weight Watchers and I can’t eat them all! However the hubby has eaten three (3) in less than 12 hours and we were sleeping for most of that. Tricks? If you don’t ave pumpkin pie spice, use the canned pumpkin pie mix instead of pure pumpkin because it is literally the pure pumpkin with the spice. Time saver! TOO SWEET? 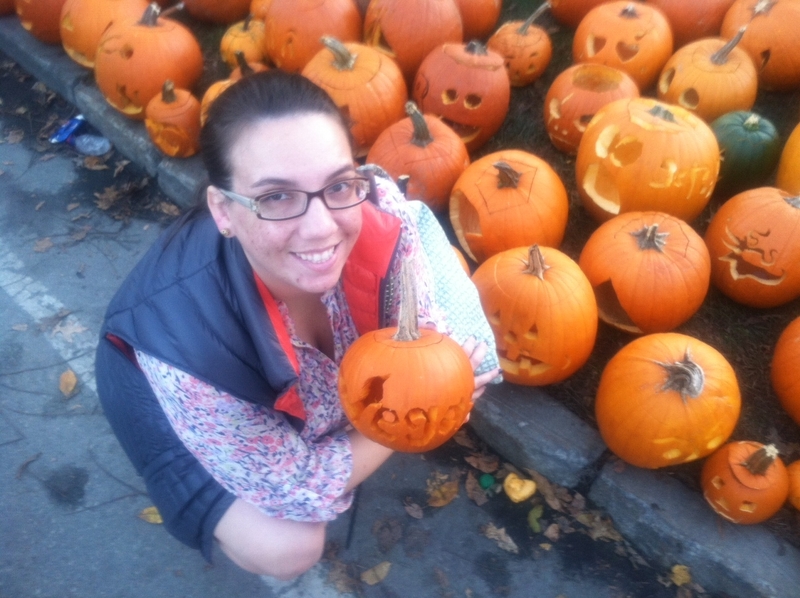 TOO PUMPKIN-Y? RECIPES CHANGES YOU SUGGEST? 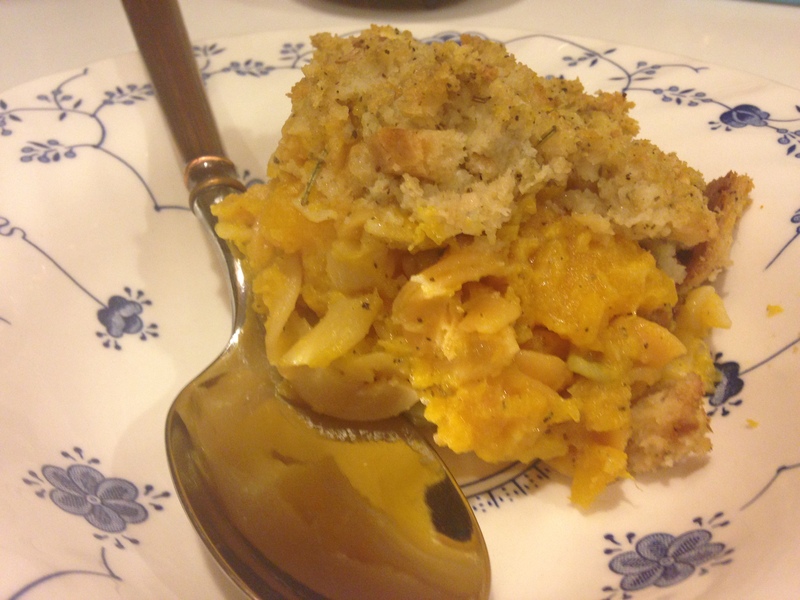 So… I will be back at the end of this week with some more recipes for your holiday needs. I keep promising to post my spinach artichoke recipe and I WILL! I finally found where I wrote it our for a friend so it will go up on here as well. I also made a fabulous everyday sundried tomato cream sauce last night and I may have to post that as well. It was super quick to make and I loved it. My husband however just broke the news to me last night that he prefers marinara so I won’t have an omnivore take on this one! He does love my apple caramel pies though so I will place that up with it. Happy Herbivore Eating Everyone! Keep it hip and take it with you!